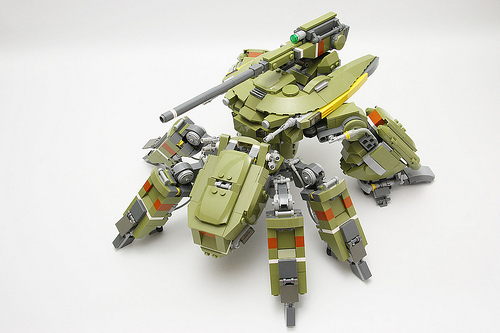 This insect-like mech by legorobo:waka makes my heart go pitter patter. It has a great, military look to it, and just seems fun. Olive juice too, mecha, olive juice too. ^ It does seem that way sometimes, but this particular model is pretty cool, don’t you think? Yes, the color can be a gimmick at times. Remember when tan was so rare? But this spider tank would look pretty cool in gray, black, white, heck even in orange. I think Legorobo has taken us well past the gimmick of rarity with this one. I don’t ususally like spider tanks… but I dig this! Rock on legorobo!